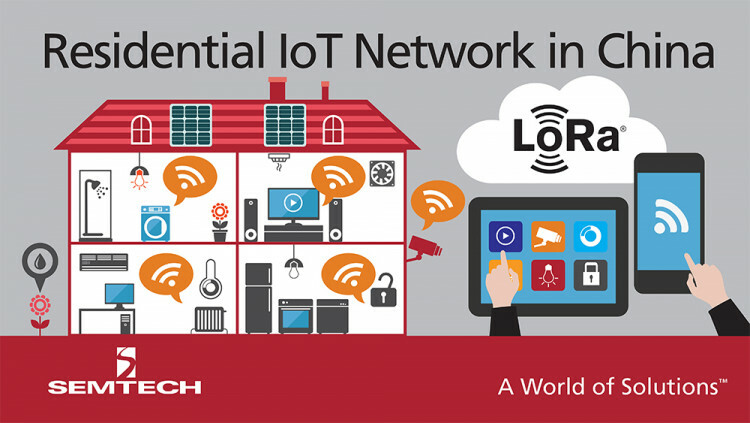 Semtech Corporation (Nasdaq: SMTC), a leading supplier of analog and mixed-signal semiconductors, today announced its LoRa® wireless platform has been adopted by the Dr. Peng Group, the largest private telecom operator in China, for its Internet of Things (IoT) residential network. Dr. Peng Group will supplement its fast broadband, fixed-line access service offerings with a smart home, low power, wide area network (LPWAN) based on Semtech’s LoRa Technology. The platform is coupled with LoRa-equipped gateways, home picocell routers and intelligent monitors to improve efficiency and safety in residences and communities. Smart home IoT applications include gas and water meters, asset tracking, smart entrances, and smart air conditioning, among other services found in homes. Dr. Peng plans to provide intelligent street lighting, soil, air and water quality monitoring, intelligent parking, intelligent trash collection, and other green belt management services. Long Range: A single LoRa base station enables deep penetration capability for dense urban environments and indoor coverage while also providing the ability to connect to sensors more than 15-30 miles away in rural areas. Low Cost: LoRa reduces up front infrastructure investments and operating costs, as well as end-node sensor costs. Open Standard: LoRaWAN ensures interoperability among applications, IoT solution providers and telecom operators to speed adoption and deployment. Dr. Peng Telecom Media Group Co., Ltd. founded in 1985, initiated its initial public offering in 1994, traded on the Shanghai Stock Exchange. It is the largest private telecommunications operator and the largest non-state owned company that offers broadband internet access and application services as its core business. Its subsidiaries in China, include the Great Wall Broadband Network Service Co., Ltd., Beijing Teletron Telecom Engineering Co., Ltd, Beijing Great Wall Broadband Network Service Co., Ltd., Great Wall Wireless, and Hiveview Technology. All statements contained herein that are not statements of historical fact, including statements that use the words “will,” “committed to,” “anticipated to,” “plans to,” “designed to,” “to deploy,” “to implement,” or other similar words or expressions, that describe Semtech Corporation’s or its management’s future plans, objectives or goals are “forward-looking statements” and are made pursuant to the Safe-Harbor provisions of the Private Securities Litigation Reform Act of 1995, as amended. Such forward-looking statements involve known and unknown risks, uncertainties and other factors that could cause the actual results of Semtech Corporation to be materially different from the historical results and/or from any future results or outcomes expressed or implied by such forward-looking statements. Such factors are further addressed in Semtech Corporation’s annual and quarterly reports, and in other documents or reports, filed with the Securities and Exchange Commission (www.sec.gov) including, without limitation, information under the captions “Management’s Discussion and Analysis of Financial Condition and Results of Operations” and “Risk Factors.” Semtech Corporation assumes no obligation to update any forward-looking statements in order to reflect events or circumstances that may arise after the date of this release, except as required by law. Semtech, the Semtech logo, LoRa, and LoRaWAN are registered trademarks or service marks of Semtech Corporation and/or its affiliates. Third-party trademarks or service marks mentioned herein are the property of their respective owners.